Gotham is apparently recasting another of its villains. Clark Gregg talks about his directorial debut on Agents of SHIELD. Scully gets an ominous vision in a new clip from The X-Files’ return. Plus, new footage from Black Lightning and Insidious: The Last Key, and what’s to come on The Gifted’s finale. Spoilers now! Event Cinemas lists Black Panther’s running time as 2 hours 15 minutes. Meanwhile, Toys ‘R Us has character bios from the packaging of the film’s tie-in action figures. Black Panther (T’Challa, played by Chadwick Boseman) – As the new king of Wakanda, T’Challa is struggling to cope with the loss of his father T’Chaka, but is determined to live up to his great legacy. 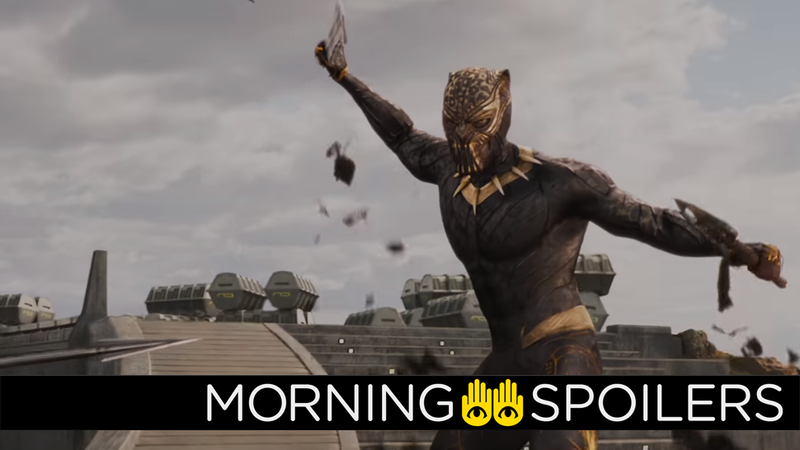 When Wakanda finds herself beset by two enemies intent on the nation’s downfall, Black Panther must use his new suit and heightened strength, speed and senses to defend Wakanda and the rest of the world. Okoye (played by Danai Gurira) – The head of the Dora Milaje, an all-female special forces group, Okoya is a fiercely loyal protector of Wakanda who isn’t afraid to question her king, but would defend him with her life. A staunch traditionalist who is as formidable with her spear as she is with her tongue, Okoye finds herself torn between her allegiance to her country and her king when T’Challa begins to challenge ancient Wakandan rules. Nakia (played by Lupita Nyong’o) – A Wakandan spy pulled from her mission abroad by her former flame T’Challa, Nakia consistently gets involved in conflict for the good of others, adamant to use her abilities to help those in need. In the wake of King T’Chaka’s death and the rise of Wakanda’s new enemies, Nakia puts her skills of subterfuge and hand-to-hand combat to use in order to fight alongside Black Panther. Shuri (played by Letitia Wright) – Shuri is T’Challa’s younger sister and head of the Wakandan Design Group, where she designs and builds futuristic tech such as the Black Panther suit with Vibranium mined from the Great Mound. She is an innovator, intelligent beyond her years, and always ready to give her big brother a hard time. Erik Killmonger (Erik Stevens, played by Michael B. Jordan) – Erik Stevens was an American black-ops soldier who earned the nickname “Killmonger” while in the field. However, after disappearing off the grid, he has reemerged with a plan that threatens to put Black Panther and all of Wakanda at risk. Using his charisma, considerable skills in combat and his surprising knowledge of Wakandan customs, Erik Killmonger is a dangerous threat to all that T’Challa holds dear. M’Baku (played by Winston Duke) – Armed with the hardened Jabari wood armor and a battle staff, M’Baku is the formidable leader of the Jabari tribe, a group of Wakandans who have shunned the use of vibranium and removed themselves from the mainstream Wakandan life. In the wake of T’Chaka’s death, M’Baku is faced with the choice of challenging T’Challa for the throne, or joining forces with his would-be adversary to defend Wakanda from malevolent outside forces. Everett Ross (played by Martin Freeman – A CIA agent and former liaison with the Joint Terrorism Task Force, Everett Ross is reunited with T’Challa when they both find themselves after the same adversary: Ulysses Klaue. A skilled tactician with advanced weapons training, Ross becomes an invaluable ally to the Black Panther. A clip from the latest Insidious reveals its ghost has a special fingertip attachment for opening doors, just like Inspector Gadget. IGN has a poster for Screen Gems’ upcoming Slender Man movie, with a trailer coming later today. In an interview with IGN, Clark Gregg described his directorial debut on the series as a cross between Downton Abbey and Gladiator... which is a hell of a mashup. It’s a big episode with some big stuff, and they really went with my ideas. Coming from indie film, I’ve really done something that’s at the farthest end of different and still is the same concept. It was like doing a mini-Marvel movie. It’s that episode, as people will see, that’s a little bit like our version of Downton Abbey-meets-a very bloody, sci-fi version of Gladiator. Gotham is looking for a new actor to play the Scarecrow—who had already returned this season, played by Charlie Tahan, reprising his role from the first season—according to a new casting call from That Hashtag Show. Elsewhere, Spoiler TV has images from episode four, “The Lost Art of Forehead Sweat,” written and directed by Darin Morgan. Click through for more. Starz has released this tie-in commercial for Shemp’s Beer in promotion of the new season. Polaris unleashes her powers in the trailer for the two-hour season finale, “eXtraction” & “X-roads”. The Pierce family fights back in the latest trailer for the CW’s Black Lightning. Finally, all your favorite CW heroes suit up in a new teaser for their upcoming mid-season returns.